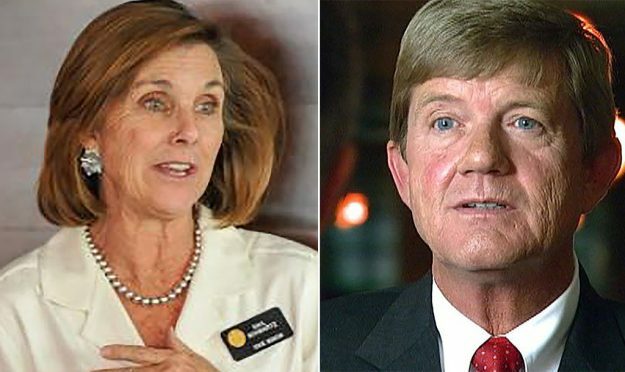 Former state Sen. Gail Schwartz, D-Crested Butte, and incumbent U.S. Rep. Scott Tipton, R-Cortez. Republican presidential candidate Donald Trump is coming back to Colorado on Tuesday – including a stop in 3rd Congressional District GOP stronghold Grand Junction – and Democrats like CD3 challenger and former state Sen. Gail Schwartz are pouncing on Trump’s increasingly negative image among women voters. Schwartz, who participated in a campaign stop by Democratic presidential candidate Hillary Clinton in Pueblo on Wednesday, issued a press release on Thursday slamming Trump and her opponent, incumbent CD3 U.S. Rep. Scott Tipton, R-Cortez. Tipton last weekend issued a statement condemning Trump’s recently released 2005 video-tape comments in which the reality TV star and New York businessman says his celebrity status allows him to sexually assault women. But Tipton refused to pull his support for the embattled GOP candidate. A spokesman for Tipton’s campaign on Thursday did not respond to a request for additional comment on Schwartz’s latest press release. Clinton chose Pueblo for her rally on Wednesday, a Democratic stronghold, the largest city in CD3 and the only CD3 city that’s on the state’s Front Range. “It’s not only women that [Trump] has disrespected, He’s insulted practically everybody,” Clinton said, referring to Trump’s comments disparaging Mexican immigrants, Muslims and others. Pueblo is also home to a large Hispanic voting bloc. Trump was in Pueblo on Oct. 3, where he defended his business prowess after the New York Times revealed he wrote off nearly a billion dollars in losses in the 1990s and may have avoided paying federal income taxes for nearly two decades. Trump’s companies have declared bankruptcy six different times. Jobs and the economy have dominated the CD3 debate. As recently as last month both Tipton and Schwartz were cautious about being associated with their respective party’s presidential candidates. Tipton told the Rocky Mountain Post: “Given our choice, I’m going to support the Republican nominee over Hillary Clinton’s job-killing agenda,” refusing to say Trump’s name. Schwartz said she was very unhappy with how Clinton handled emails with a personal server during her tenure as secretary of state, and both candidates avoided their respective party conventions in July. But after the latest sexual-assault scandal, the U.S. House of Representatives, once considered a lock for Republicans, is reportedly back in play for possible Democratic control on Nov. 8 – and Colorado could play a pivotal role in that battle. Fearing a negative backlash on election day, House Speaker Paul Ryan has stopped campaigning with Trump and said this week he will no longer continue to defend his party’s presidential nominee. Another Colorado Republican in a tight re-election battle, U.S. Rep. Mike Coffman, outright pulled his support for Trump in the wake of the latest scandal. Democratic Colorado Gov. John Hickenlooper on Friday announced he will denounce Trump’s defense of his comments as “locker room” talk at a Clinton campaign event with local athletes in Colorado Springs called “Not In Our Locker Room”. Hickenlooper has endorsed Schwartz for Tipton’s CD3 seat. To stem the bleeding, the Trump campaign in Colorado on Thursday released a list of Republican state lawmakers who still support the party’s presidential nominee (see press release below). Notably absent from the list on Colorado’s Western Slope is state Sen. Randy Baumgardner, a Hot Sulphur Springs Republican facing a heated challenge from Breckenridge Democrat Emily Tracy. Ignacio Republican state Rep. J. Paul Brown, facing Durango Democrat Barbara McLachlan, did sign onto the list of Trump supporters. “The Trump campaign in Colorado is pleased to announce the support of Colorado Republican legislative leaders. Following is a statement of support for the Republican nominee for President and a number of state elected officials who are standing with Mr. Trump.” Said Patrick Davis, Colorado Senior Advisor. “As an elected official and Republican leader I fully support the Republican nominee for President Donald J Trump. Mr. Trump presents a unique opportunity for America to move in a decidedly different direction. With the Supreme Court at risk, this is the time for those in leadership to stand strong and unified.